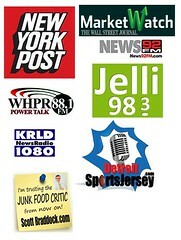 I will admit – the marketing on this roll-out was STRONG and it pulled me in by the tractor beam. As a NY pizza style lover – I thought this was a genius move on CiCi’s part…..IF they could pull it off. Turns out….it was too big of an “IF”. Take a look at the edges of the crust….it’s almost burnt. 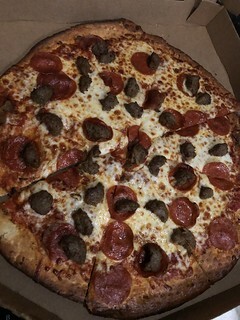 The sauce, cheese, pepperoni, and meatball toppings do NOTHING to sell this to me as “NY style” or anything other than a bigger-sized regular ol’ CiCi’s pizza. …ahhhhh once again we catch up with my all-time favorite pizza parlor….Mazzio’s. Unfortunately there isn’t a Mazzio’s close to me. Sad emoji. 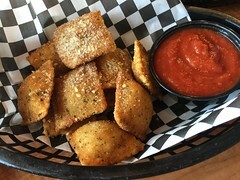 So whenever I am in a town that has a Mazzio’s, I am always instantly craving pizza….and sometimes I forget that they make other things that are just as awesome – like this “Toasted Ravioli”. It’s sausage and cheese blended and breaded raviolis then dusted with cheese and served up with some marinara sauce. It’s a fantastic appetizer, snack, or meal by itself! Love, Love, LOVE these!!!!! woo! OHHHH wow. These are some tempting snacks. I mean look at that bag, baby. Deep Dish Pizza? Bring it on! Herr’s is a relative new kid on the block, as I only remember seeing them in the last year or so. Maybe they have been around forever. What I do know is they step their game up with ideas like this. They taste like you might expect – cheese, a slight tomato, and some Italian herb…..highly snackable! LOOK at those babies! They almost GLOW in the dark! I found them at Dollar General, but I am also seeing them pop up in other places so give them a try and comment below how you like them! This. is. Genius. 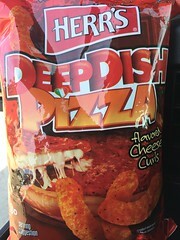 I LOVE deep dish pizza…wait…I prefer Thin crust pizza…but when I get a hankerin’ for deep dish…that hankerin’ is SERIOUS!!! ….so to have this as an emergency craving-buster is awesome! It even comes with its own pan! 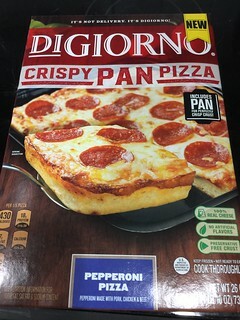 I went with your basic pepperoni…and my constant thought is that this reminds me of Little Caesars Deep Dish…which I adore…..so these be some high standards I am thrusting on this frozen pie. Looking at that pic…the undercrust looks slightly UNdone to me. I want that crispy crunchy edges like I get from Little Caesars. But I am positive and hopeful this is gonna turn out great! Minutes later I am thinking I should over-cook it just a tad to get some char….and you see my results. Some might say I burnt the thing. This was so very good. Not as good as Little Caesars but come on……. In hindsight I should have pulled the pie out a few minutes early and sprayed some oil in the pan so it could cook he bottom crust more. But it was a solid pizza. Needed extra sauce though…but that’s an easy fix. I would totally serve these up at a last-minute party or gametime snack attack. Okay first of all I love the name. Caesar talks like me. We could be mates. Pizza. Pizza. …it tells you on the box…duh. The first thing I noticed was the crust is thicker than normal. I am sure this is to handle the weight of all that extra cheese and meat. I really liked the thicker crust. This pizza has some serious HEFT to it. It’s solid and filling. It’s also twice as greasy as their regular pie…..as you can see …there was so much grease that it soaked through the box and was actually seeping into my car seat…..
…..but DAMN this pie was AWESOME!!!!! The extra REALLY sets it off. Get a side of CRAZY SAUCE to go with and you got one hell of a pizza night. They TOTALLY need to keep this on the menu. Or at least in the rotation of specials. DEFINITELY worth it. Love the look of this place. It’s got a great vibe to it. Laid-back-loft is what it reminds me of. The staff was helpful and friendly and I ordered ya basic two meat pie. I chilled in the cool joint and waited for my pizza. Oh….ALDI. How you continue to surprise me. The thing with Aldi (which you can either love or hate) is that you have to start over. You go into that store having NO idea if their chips are as good as the ones you normally buy….so to me it’s an adventure…trying everything all over again for the first time. Take this pizza for example. I was so very happy with this pie. The crust, sauce, and toppings all worked well together. It was full of flavor at a cheaper price than other pizzas in the same category. Win. Win. This would be the perfect pie to cook for you…or some friends and have a movie night or watch a game and chow down.